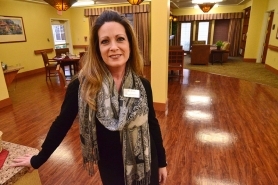 Lisa Sienkiewicz shows off the result of a remodel that expanded The Pearl at Kruse Way rehab health center. Fish Marketing recently coordinated a PR project for Avamere Family of Companies. The Avamere story appeared in the print and online editions of The Lake Oswego Review. The article also appeared in the online edition of the West Linn Tidings. The Pearl at Kruse Way Rehabilitation Health Center and Memory Care Residence – a facility managed by Avamere – has expanded its rehabilitation unit by over 50% from 29 to 45 beds. The increase in capacity is a response to the heavy demand for skilled senior care in the Lake Oswego community. The Pearl at Kruse Way Rehabilitation Health Center helps adults recover from trauma, surgery, or major illness. Directed by each client’s physician, their multidisciplinary team of nurses, social workers, dieticians and rehabilitation therapists develop individualized rehabilitation programs.